Support Our Troops: Get US Out of the United Nations! There are several reasons why the United States should withdraw from the United Nations. One of our top reasons relates to protecting our military forces. Why? Let’s explain. There are several reasons why the United States should withdraw from the United Nations (Image from Wikimedia Commons by TheZachMorrisExperience Creative Commons). The complete text of the UN Charter’s Article 25 states: “The Members of the United Nations agree to accept and carry out the decisions of the Security Council in accordance with the present Charter.” That clearly stated requirement supersedes adherence to the U.S. Constitution. That any U.S. government official would agree to that is incredible. When the UN’s Security Council decides to act, our nation’s membership requires the United States to “accept and carry out” what the Security Council wants done. It is true that our nation possesses a veto that can be used to block passage of any Security Council resolution. But U.S. leaders don’t exercise this veto power. It was a UN Security Council resolution that got our nation into the 1950 Korean War, not a required congressional declaration. Had there been a declaration of war and if its inherent goal had been to gain victory, the Korean War could have been won. But victory was denied (by the UN) and as a result our nation still has tens of thousands of troops in South Korea — all of whom serve in the overall UN Command. When the UN Security Council decides to send military forces to carry out its decisions, all member nations are required to participate. As stated in the Charter’s Article 42 and 43, “All Members … undertake to make available to the Security Council” whatever forces are needed. There are 193 UN member nations. Very few respond to Security Council resolutions as called for by Article 42. But the United States always responds with personnel, weapons, and the funds needed to carry out the UN’s missions. The U.S. military has become the enforcement arm of the United Nations. In 1990, a UN Security Council resolution was sought and obtained by President George H.W. Bush for the first invasion of Iraq. He even boasted, “The Gulf crisis has to do with a New World Order. And that New World Order is only going to be enhanced if this newly activated peace-keeping function of the United Nations proves to be effective.” Another Security Council resolution was sought and obtained by President George W. Bush for the second invasion of Iraq in 2003. Articles 52-54 of the UN Charter permit nations to form “Regional Arrangements” to conduct military operations. Under these three articles in the Charter, NATO and SEATO were created. The UN subsidiary SEATO (Southeast Asia Treaty Organization) was relied upon to have U.S. forces participate in the Vietnam War. Restrictions placed on their actions prevented victory and assured defeat. SEATO no longer exists. NATO was then cited for authorization to conduct operations in Afghanistan. But no declaration of war as required by the U.S. Constitution was issued; none have been issued since our nation consented to UN membership in 1945. Finally, Article 2 of the UN Charter states: “nothing contained in the present Charter shall authorize the United Nations to intervene in matters which are essentially within the domestic jurisdiction of any state….” But the UN meddles in an array of matters, which are certainly within the jurisdiction of individual states (countries). The UN has meddled in our nation’s affairs in such matters as abortion, capital punishment, the right to be armed, border control, mining, judicial decisions, and more. It is perfectly obvious that the UN violates its own Charter. It should be known as a lawless governmental agency seeking power over the entire world. The United Nations cannot be fixed and made tolerable. Its founders intended it to be the seat of unchallengeable world power. Its reach has grown enormously and, every day, the UN moves closer to becoming the ruler of mankind, with the aid of our military! So the opportunity to withdraw, which is what many Americans want, should be seized upon. The abuse of our troops must end and the steady erosion of both the Declaration of Independence and the U.S. Constitution must cease. It is long past the time to Get US out! Contact Congress today. Mr. McManus served in the U.S. Marine Corps in the late 1950s and is author of “Changing Commands: The Betrayal of America’s Military.” He joined the staff of The John Birch Society in August 1966 and has served various roles for the organization including Field Coordinator, Director of Public Affairs, and now President. He remains the Society’s chief media representative throughout the nation and has appeared on hundreds of radio and television programs. Mr. McManus is also Publisher of The New American magazine and author of a number of educational DVDs and books. Vermont Senator Bernie Sanders is a candidate for the Democratic Party’s nomination for president. There aren’t many who think he has even a ghost of a chance to get it. Does he have an ulterior motive? Is there something else he wants to accomplish by throwing his name into the mix? We have no inside information about Bernie’s motive. He likely knows that an admitted socialist (that’s what he is) doesn’t stand much chance to go very far. It is surprising and somewhat disappointing to know that enough people in Vermont aren’t revolted by socialism to have rejected him as he won ascending political posts: the mayor of Burlington, then as their congressman, and then one of their two senators. But most Americans, not just a majority in Vermont, don’t have a clue about what socialism really entails. Hint: One of its most famous promoters was a fellow named Karl Marx. So what’s going on here? One answer is that many politicians throw their hats into the presidential ring in order to become better known. They even expect to lose. But being a contender for the nation’s highest office helps them in future elections. It’s name recognition, not positions on issues, that constitutes the most important attribute a candidate can have. An upstart “nobody” rarely wins in this country. Get your name and your face before the public and you might have a chance. And doing so in the presidential sweepstakes gets one’s name known. Bernie already knows this. And hardly anyone in Vermont is unaware that Bernie represents them in the halls of Congress. He doesn’t need the exposure a presidential contender gets. As for voters in the rest of the country, a huge chunk of them find him laughable – lovingly so, but still laughable. So what else could drive Bernie? Again, we can only speculate, so it sure seems as though opposition from Bernie will make Hillary Clinton seem more centrist. We can’t think of many others who could do that. She becomes less dangerous to many if her opposition for the nomination is the gruff-talking, mussed-hair guy with the Brooklyn twang (originally from Brooklyn, it shows when he speaks). But Bernie’s in the race to become President of the United States. Could there be anything good to come out of him winning? Maybe it would be better for the country if an admitted socialist moved into the White House. Then there might be more resistance in Congress. There certainly is a need for more congressional resistance because, Bernie or no Bernie, the country is adopting socialism. Were he still alive, Karl Marx would be delighted. We are grateful to Allan Brownfeld (“The Conservative Curmudgeon”) for his insightful survey of conditions in Baltimore that led him to conclude that other factors, not ”white racism,” prompted the rioting and destruction in that city after the arrest and subsequent death of Freddie Gray. Only 25 years-old when he perished, Gray was no stranger to police. First arrested at age 18 on charges that he was peddling drugs, he accumulated at least a dozen more arrests in his brief life. His final run-in with police was also drug-related. The area where he lived and operated was once home for thousands of blacks who made a good living manufacturing goods for Bethlehem Steel, General Motors, and Martin Marietta. They suffered when those jobs were lost. Poverty followed, as well as a loss of the kind of stability that sustains strong family life. In most of America’s inner cities, the breakdown of the family and the sound influences over the young that families supply is enormously relevant when assessing what goes wrong. Many homes are led by a single parent and over 72 percent of babies born in inner cities are born to single mothers. Brownfeld cites a passage from the book “The Best Parent is Both Parents” by David Levy who notes that neither poverty nor race is the primary cause of crime. The breakdown of the stable family should be blamed. Professor Orlando Patterson, a black sociologist at Harvard University, claims that a preponderance of black men are in jail not “because cops, prosecutors, judges and juries are racist” but because of the factors cited above. Will the federal investigators looking into the death of Freddie Gray and the rioting and looting that followed factor all of these considerations into their findings? We can only hope so. The already widely heard charge of white racism ought to be ignored. Until all these other causes are acknowledged and dealt with, there will likely be more Baltimores. While it is true that many Americans are woefully unfamiliar with the U.S. Constitution, it is also true that some members of Congress have a deficient appreciation of the document. They know when they have to stand for reelection. And they know the part about receiving compensation for their services. But many seem to have forgotten (or never knew in the first place) that only Congress – not the President and not the federal courts – has power to make law; only Congress can send the nation into war; and only Congress has power to coin money. 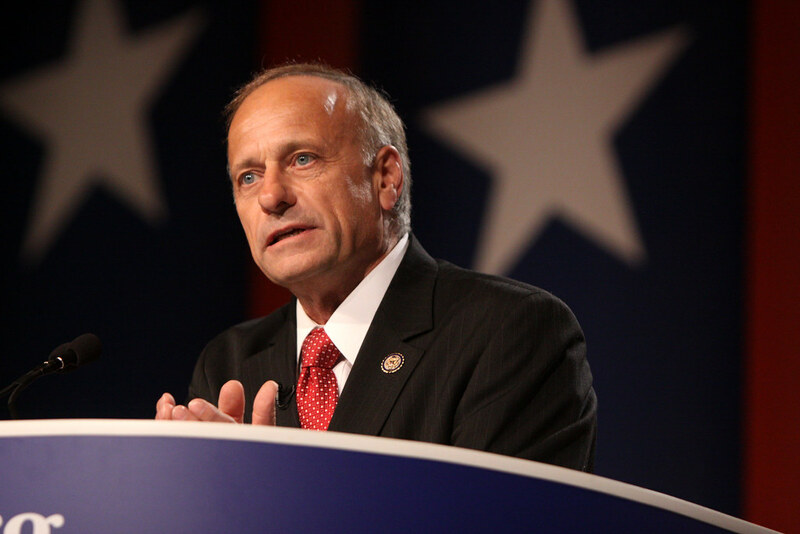 Rep. Steve King (R-IA) (Image from Flickr by Gage Skidmore Some rights reserved). Also little known is the portion of Article III which states: “The judicial Power of the United States shall be vested in one supreme Court, and in such inferior Courts as the Congress may from time to time ordain and establish.” In simple terms, this means that the only federal court required is the Supreme Court; all federal district courts could be abolished by Congress. Not only that, Section 2 of this Article gives power to Congress to limit the jurisdiction of all federal courts. When forced busing of school children was ordered by federal courts in the 1970s, then-Congressman Larry McDonald introduced legislation to bar all federal courts from having anything to say about placement of youngsters in schools. He cited Article III, Section 2 as the authority for such a step. His measure didn’t gather enough support in Congress to be enacted but many who served at the time were at least forced to recognize that Congress possessed such power and that it actually existed and could be employed. On April 22nd of this current year, Congressman Steve King (R-Iowa) filed H. R. 1968, the “Restrain the Judges on Marriage Act of 2015.” Relying on Article III, Section 2 of the U.S. Constitution, he seeks to remove jurisdiction of the Supreme Court and all lower federal courts to “hear or decide any question pertaining to the interpretation of, or the validity under the Constitution of, any type of marriage.” Mr. King stated his belief that the Congress could put a halt to the possibility that the Supreme Court would actually redefine marriage in a decision expected in June. Nine co-sponsors immediately announced their support for H. R. 1968. They are Babin and Gohmert of Texas, Duncan of Tenn., LaMalfa of Cal., Massie of Ky., Palazzo of Miss., Thompson of Penn., Walberg of Mich., and Yoho of Fla. Commenting on his measure, Congressman King said that removal of federal jurisdiction over the definition of marriage would have no effect on the states, each of which could decide the matter for its own people. But he was especially concerned that a mere five judges at the Supreme Court level could overturn the definition of marriage for the entire country, a definition that has been held for millennia in which marriage is considered only to be between one man and one woman. Texas Senator Ted Cruz has introduced an identical bill in the Senate (S.1080). As of this writing, no Senate co-sponsors have been garnered. Members of the House of Representatives should be contacted (call 202-225-3121 and email) and asked to support H. R. 1968. Thanks should be sent to Rep. King and the co-sponsors of H.R. 1968. A companion bill in the Senate (S. 1080) has been introduced by Texas Senator Ted Cruz. No Senate co-sponsors have yet been enlisted. Contact (call 202-224-3121) your senators to get them to co-sponsor and support the bill. Utilizing the email link above will send to both the House and the Senate, but be sure to call. Congressmen tell us that phone calls are more effective than emails. The appointment of Loretta Lynch to be the nation’s Attorney General won Senate confirmation on April 23, 2015. She is now the successor of Eric Holder who had held the office during all the previous years of the Obama presidency. But Ms. Lynch never committed herself regarding the matter, dancing around it like so many federal officials have done over many years. That alone should have been enough reason for senators to refuse confirmation. But she survived thanks to the efforts of Senate Majority Leader Mitch McConnell (R-Ky.) and a number of go-along senators. The Senate’s procedural rules contain the possible use of the procedure known as filibuster. It allows continued debate about an issue, even drag on indefinitely, until an objectionable measure is withdrawn. While a filibuster in underway, no other Senate business can be conducted. Use of the filibuster, therefore, is a fairly powerful tactic. Senate rules state that breaking one needs the votes of 60 senators. This means that a mere 40 can start a filibuster and continue it for as long as it may take in order to have an objectionable measure or confirmation withdrawn. Top Republican Senator Mitch McConnell of Kentucky wanted the Lynch nomination approved. Some Republican senators indicated that they would approve the nomination. Others sought to create a filibuster. But breaking one had to be accomplished first. So he convinced 10 senators who were opposed to the nomination to vote to break any possible use of the filibuster. More than 60 votes were needed to do so and ten senators who would later vote against confirmation of Ms. Lynch dutifully went along with the McConnell plan. With all 46 Democrats and several additional Republicans supporting cloture (the breaking of any possible filibuster), that hurdle was overcome. The ten who sided with McConnell in the cloture vote went on to vote against her confirmation in the final vote. So they are able to say to constituents that they were opposed to approving Ms. Lynch, thereby seeming to uphold condemnation of the president’s expressed desire to usurp congressional law-making power. But had they not lined up with McConnell in the cloture vote, Ms. Lynch would never have been confirmed. It was a very slippery move. The ten slippery Republican senators who voted to cut off debate on the nomination (the cloture vote) are: Alexander (Tenn.), Corker (Tenn.) Burr (N.C.), Tillis (N.C.),Capito (W.Va.), Gardner (Colo.), Roberts (Kan.), Cornyn (Texas). Rounds (S.D. ), and Thune (S.D.). Constituents might care to let these senators know that they key role they played in confirming Loretta Lynch to be Attorney General will not be forgotten. Ten other senators who voted with the Democrats to approve the nomination of Ms. Lynch were wrong to do so, but they weren’t so devious. Their vote deserves some condemnation as well. The ten GOP senators who voted for confirmation after the filibuster threat had been defeated are: Ayotte (N.H.), Cochran (Miss. ), Collins (Maine), Flake (Ariz.), Graham (S.C.), Hatch (Utah), Johnson (Wis.), Kirk (Ill.), McConnell (Ky.), and Portman (Ohio). Now our nation has another Attorney General willing to thumb her nose at the Constitution.